2000 CD 75 3-partitioned case to hold 75* CDs. 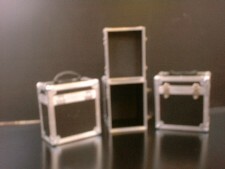 2000 CD 150* 3-partitioned case to hold 150 CDs. *When in orignal plastic covers at least double amount using 'pro' sleeves. 2000 RD 1 Fully foamed case to fit 1200/1210 (or similar) turntable. Space at back to facilitate pre-wiring. 2000 MC 1 Small mic/general purpose case. Egg carton foam throughout. (415 x 295 x 10-80 var. approx). 2000 MC 2 As MC1, but with solid self-adhesive foam in base for customising. (440 x 315 x 60-90 var. approx). 2000 P&R1 Large pack and roll case, 4 x recessed handles; internal, approx 47 x 22 x 22 (1200 x 560 x 560), butterfly catches, H/D hinges, 4" castors (2 locking). 2000 P&R2 As above, but with 12mm plastizote foam lining. All measurements approx 25mm less. 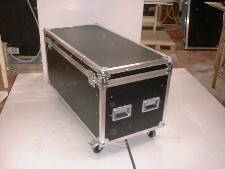 2000 STD Unlined, to carry stands and other hardware. Internal: 47 x 10 x 10" (approx), 3 x stop hinges, 3 x large drawbolt catches; 2 x rec. handles on lid and 1 x rec. handle at end, 2 x castors on base for 'tilt and roll' ease of carrying.